At Oakridge, we pride ourselves on delivering quality construction services in a cost effective manner. By delivering on what we promise - competitive pricing, quick delivery and a facility built to the highest level of quality - Oakridge has been selected as the contractor-of-choice by several repeat clients. From general construction to Design-Build and construction management, Oakridge brings expertise and know-how to every project. As a division of Flintco, LLC, we benefit from the resources of a $1 billion national construction company while still offering our clients the personalized service of a small company. 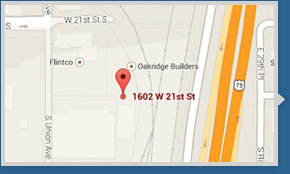 Oakridge is based in Tulsa, Okla. and has delivered projects in Oklahoma and Arkansas. No matter the project size or location, Oakridge is ready to serve as your hometown commercial builder.